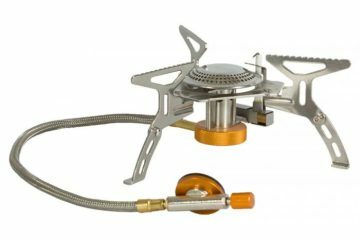 Vango has been making camping and hiking equipment since 1963 and its portfolio has kit to suit every type of outdoor enthusiast, from family campers to D of E trekkers to high-altitude mountaineers. 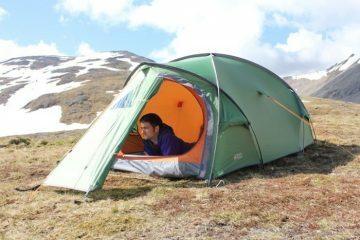 The Hurricane 200 is a fairly heavy tent (4.2kg) that packs down into a stuff sack that, by the standards of this test, is pretty bulky. But then the Hurricane 200 isn’t the type of tent a lightweight backpacker is going to be taking with them. Putting up the tent was no hassle at all. The four poles are colour-coordinated with the sleeves so there’s no confusion as to which goes where, and to make the pitching even simpler the inner and outer go up as one. The tent features two equally sized porches that are big enough to fit your packs in while still allowing room for sheltered cooking. It’s also good to be able to split storage and cooking spaces up. 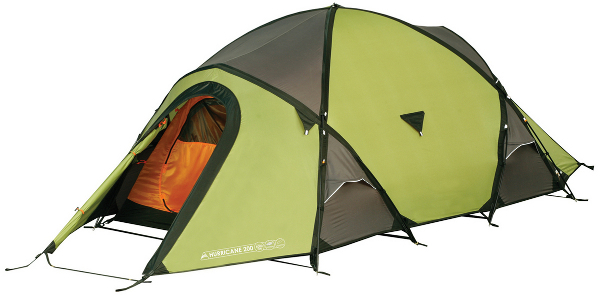 Similarly to the Blacks Octane, the Vango Hurricane features an insect net that covers half of the door. While full nets would have offered more ventilation, as there’s two of them they’ll still do the job. Add to that the four side vents on the tent and there are plenty of ventilation points. The inner’s one of the nicest I’ve seen. There’s enough room for a six-footer to stretch out, and the height gives almost a foot of clearance when sat up. Width wise, you’re not going to be bothered by you’re partner rolling on top of you every time they turn over. Inner storage is fantastic with eight mesh pockets lining the sides, and the mesh hanging net on the roof was particularly brilliant. One thing I do have to say about this tent is that it’s worth airing it out for a day from new as the glue used in production produces a pretty awful rotten fish smell.